Looking for more iconic attractions to see while you visit Paris? You must download our Free 4-Day Paris Itinerary! Travellers from all around the world love to visit Notre Dame, making it one of the most-visited tourist destinations in Paris. The Notre Dame brings people together from all over the world in a religious cathedral in the heart of Paris. This guide explains everything you should be aware of when planning to visit Notre Dame or climbing to the top of the tower. Read on! Continue reading to better understand the history of the cathedral before you visit Notre Dame for real! 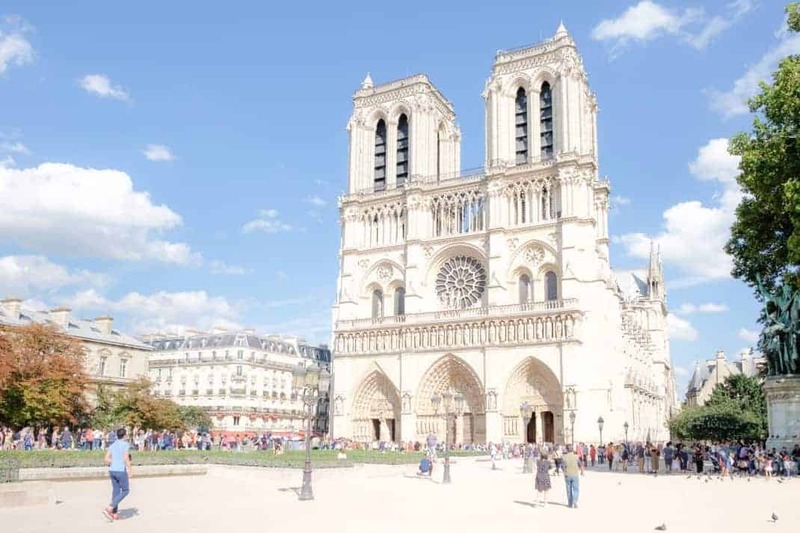 The Notre Dame Cathedral was built between 1163-1250 and was famously the destination of the crowning of Napoleon (and setting of Victor Hugo’s novel Notre Dame de Paris!). The construction began in 1163, which took more than 200 years to complete, today remaining as one of the best standing masterpieces of Gothic architecture and a UNESCO World Heritage Site as of 1991. It is completely free to visit the inside of the Notre Dame, after queuing (which appears daunting but moves rather quickly!). Since it is free when you visit Notre Dame, the Paris Museum Pass is not valid to skip the line. We recommend setting aside 1-2 hours total to visit Notre Dame and especially to take in all the stunning stained glass windows. You may take photos inside, but without flash or tripods! The facade of the Notre Dame no longer contains all its original statues, but the 56 gargoyles overlooking the city should definitely be seen. We recommend having a walk around the entirety of the cathedral with you visit Notre Dame, including the charming park behind it to see the gargoyles leaning over the streets! The morning when there are fewer tourists! To visit Notre Dame, we recommend to have decent outfit for both men and women. Flip-flops or crop top and super short mini skirt are not allowed inside the cathedral. There are plenty of Gothic architectural masterpieces in France, which you will find resonate with the cathedral after you visit Notre Dame. One of the most impressive ones is in Rouen, which is only one hour from Paris! The city’s bell tower boasts a height of 151 meters and it is France’s highest church. Right outside Notre Dame! All destinations in France are calculated from this point zero. There are about 5 masses a day celebrated in Notre Dame. It can get very busy over special holiday periods like Christmas or Easter Sunday. Find the updated schedule of the celebration here. The view of Parisian streets and Paris’ cityscape from the top of the Notre Dame is superb. You will be able to overlook the entire width of the Seine. Needless to say, the 422 step climb is definitely worth it and makes it among the most instagram worthy views in Paris. If you have the Paris Museum Pass, you are completely covered when you visit Notre Dame! If not, the ticket cots 10€. However, be aware that there are new rules when you visit Notre Dame and its tower! The new protocol is as follows: there are now two different ways you can make a reservation to climb to the top of Notre Dame. The first way you can avoid waiting in line when you visit Notre Dame is by going to the entrance of the tower where you will use the machine to choose the time you want to visit on that day. Then you must come back at that time you’re requested to visit Notre Dame (payments made inside!). The second way is to download the Jefile app first on your phone and make the reservation on your own phone, going to visit Notre Dame directly at the time you requested. This app reduces any time you may spend in line, just be sure to make the reservation to visit Notre Dame in the morning, especially during peak season! Make sure you’re on time!